Cucumbers are popping everyday now, all over. One day there is a flower or a tiny little baby cucumber, the next day the thing is massive! We work to pick them every single day, as the massive ones are too weird to eat, it is best to locate while still manageable. 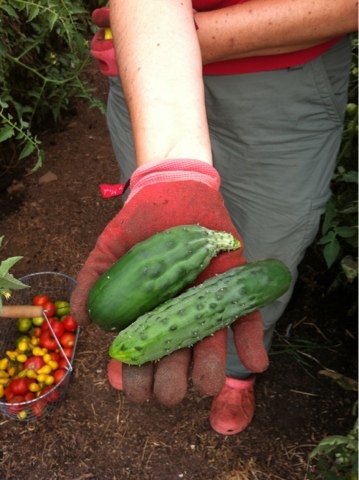 Another thing happens with these open pollinated types of cucumbers we grow. They are not perfect. They have different shapes, not just sizes. At this time of year the cucumbers are sorted into 3 piles: the vast majority leave the farm in CSA boxes. The few that really get missed for multiple days and grow into freak show produce go to the pigs. And the few that don't look quite right but are perfectly fine are the ones the farmer eats. None of the cucumbers receive the wax bath that make the hybrid, store variety ones smooth, shiny and spineless. Ours have the little spines, have some bumpy surfaces, and when they flower keep bumble bees, mason bees and a variety of other pollinators buzzing. Combined with the beautiful, multihued tomatoes in the basket these make a perfect summer meal.